Brother/Sister is a quick and pacy read with a distinctively different style of story telling used to tell the story of Asheley and Will a troubled brother and sister. The story is told in alternating chapters switching between the two main characters Will and Asheley and is clearly from some kind of interview in which they retell their story from their own point of view. It took me a few chapters to get into it but in the end I really liked getting the story from both Will and Asheley's point of view. Will is a bit of a recluse. he doesn't mix with people of his own age much apart to play golf and even then he would prefer to do this alone. He has a reputation at school for being a bit strange and losing it over little thing. Asheley is naturally a bit more social despite the fact that the circumstances that she grew up in meant she often isn't able to mix and socialise with others her own age despite being keen to do so. 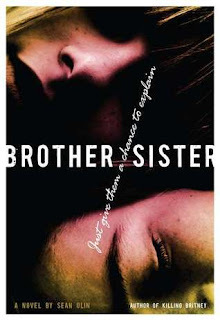 The events of this book all kick of when the siblings mother is taken into rehab. Having lived for years with a drunk the pair are initially relieved and cope without the presence of parental figure within the household quite well. Then Asheley, desperate to fit in, throws a party and everything starts to go wrong from there. The events lead to a tragic accident which unleashes something within Will that he can't reign back in. As the book progressed the relationship between Will and Asheley gets a bit more uncomfortable to read about, with Will's behaviour getting increasingly more obsessive and overprotective. What's interesting about it is that the changes come gradually in little baby steps at first but by the end of the book they start to snowball to the point where Asheley in particular doesn't feel she is either in control of the situation any longer nor can she do anything about it. A fast paced read which will keep with you and make you think with lots of interesting twists and turns. Definitely worth a read. This sounds really interesting, I'll definitely be looking into it! I was a bit unsure about this one but after reading your review I think I might give it a try. awesome review... I really want to read this one as I'm intrigued by the story! Your review just made my longing worse! I've heard some really interesting things about this book and each review I've read so far, yours includes, gives little snippets that just make me more intrigued to read this book.